Artistic Artifacts in Alexandria, VA has BERNINA-trained repair technicians on staff. 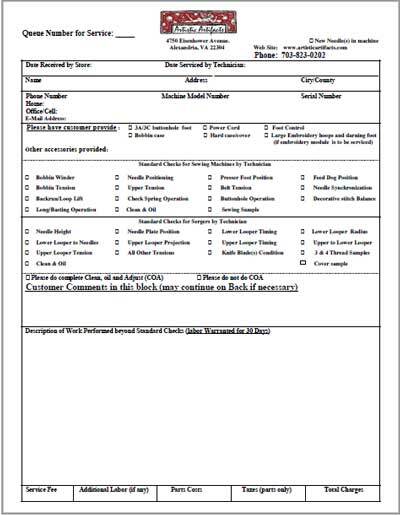 You will be asked to complete our Service Department check in form. You may download a PDF version here to fill out in advance of bringing in your machine. Please allow up to 2 weeks for servicing/cleaning. Machines are serviced in order of arrival. An estimate of the length of your wait can be provided after the machine has been examined by our technician. Service is warranted for 30 days after pick-up. In addition to your sewing machine, the following items* are required when bringing it in for servicing or cleaning. Missing items may slow down the completion of your service. Please do not bring any additional items. Artistic Artifacts will not be responsible for any additional accessories left with the machine while it is being serviced. NOTE: Please make a backup of your embroidery designs on a personal design card or hard drive before bringing your BERNINA in for servicing. Artistic Artifacts is not responsible for any designs you may have saved on your machine. All service customers will be asked to provide a detailed description of the problem requiring repair on their Service Department check in form. Include the type of thread and needle used when problem occurred. If possible, bring in a sewn example that illustrates the issue; a stitch sample or video of the problem can be helpful in diagnosing the issue. 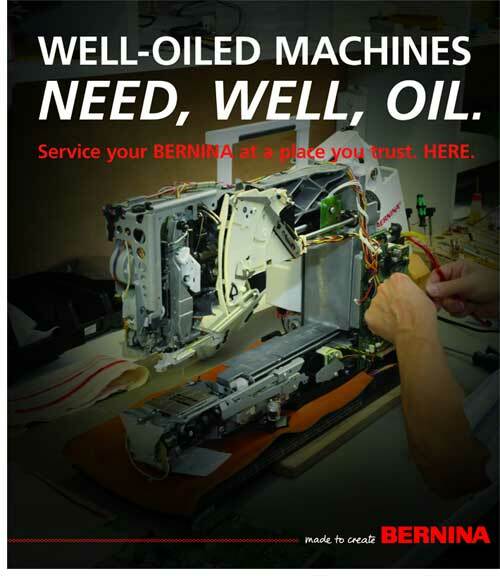 Email us or phone (703) 823-0202 to learn more about having your BERNINA serviced at Artistic Artifacts.